Strictly speaking, Basecamp should not be regarded as a project management tool. Even its developers agree to this. “Basecamp is the leading web-based project collaboration tool”—says the official site of this highly respected program in large font. Basecamp is a communication tool. It is alternative to emails. Basecamp will not be able to measure the work load for the whole team nor for each member individually. Basecamp is also unable to evaluate the realism of set deadlines. Instead, it simply helps us at exchanging the required information inside a team and with our clients. Hence, it does not make much sense comparing Basecamp against Microsoft Project, or Copper Project, if we are talking about online solutions. These great products solve completely different tasks. Why bother wasting time talking about it? The point is that we should look for alternatives to Basecamp not in the “Project management tools” section but in the “Collaboration tools” bunch. This bunch reveals an exciting world of wiki engines tailored to the needs of small businesses to various extent. Generally, these tools are rather scary-looking and appear to be difficult from handling perspective at first sight: it is not obvious what button should be pushed first to start things working. Introducing such wikis is the business of enthusiasts who strongly believe in the power of wiki environment and able to cast this belief down to the people surrounding them. Fortunately, we also see engines with more human face that general people like you and me would have no trouble handling, such as: Jive SBS, Socialtext, Confluence, PBworks. In today’s review we will talk about the latter. 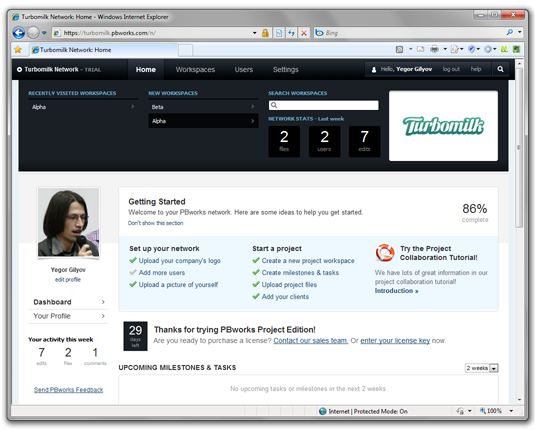 To be more precise, about PBworks Project Edition. As it becomes clear from the name, this solution targets the Basecamp’s niche of project collaboration tools. What Basecamp calls a project PBworks calls a workspace. 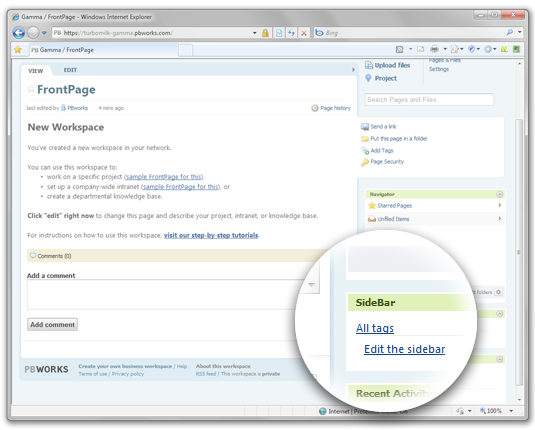 Here in PBworks each workspace dwells under a separate subdomain. So, if we (Turbomilk, the company) do a project for company XYZ, all the communication will be concentrated under turbomilk-XYZ.pbworks.com. The main difference from Basecamp: a project does not appear like a blog. I.e. the pages are not places in a linear sequence but live independently and link to each other when necessary. At first, such freedom is discouraging. It becomes obvious that the system will require extra efforts to keep all the necessary information at the fingertips: placing links, placing pages into folders and assigning tags to them. Frankly speaking, I should say that it is not always easy to find the required information in Basecamp, especially if we are talking about a lengthy project. The tags for instance would come really handy. 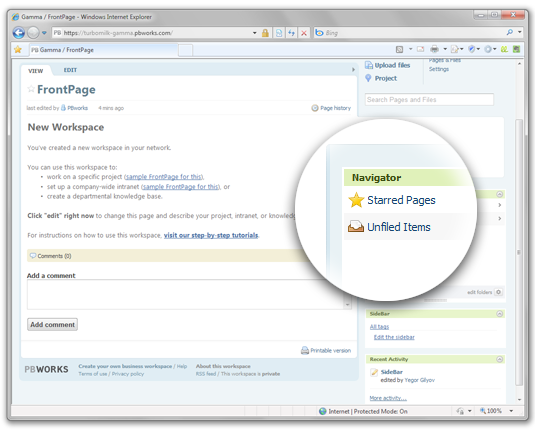 You can add anything to this panel and it will be visible on all pages within a workspace. It is extremely useful! 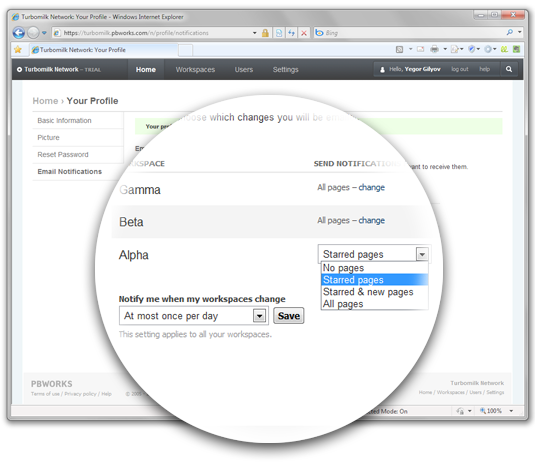 Pages in PBworks are edited using a visual editor with enriched text-formatting features. It clearly appears to be typical for any contemporary wiki-engines. Today it is rather hard to make a user learn the special wiki language, and obviously it is not the case here. 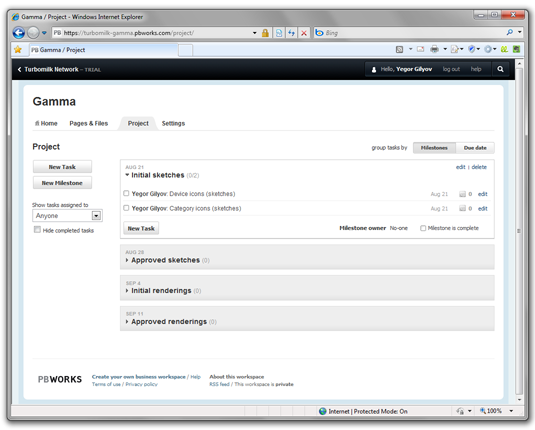 And, of course, just like any other wiki engine, PBworks saves various versions of pages. 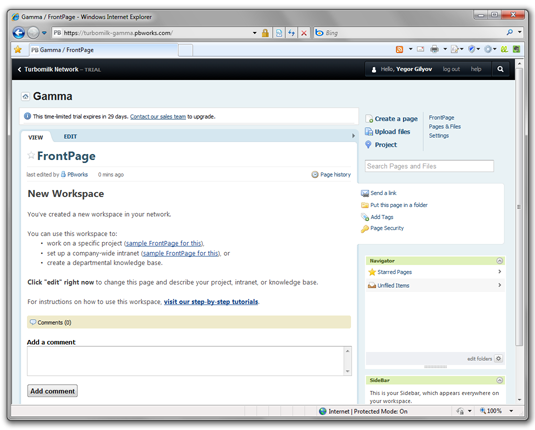 It is similar to what Basecamp offers in the Writeboards section. 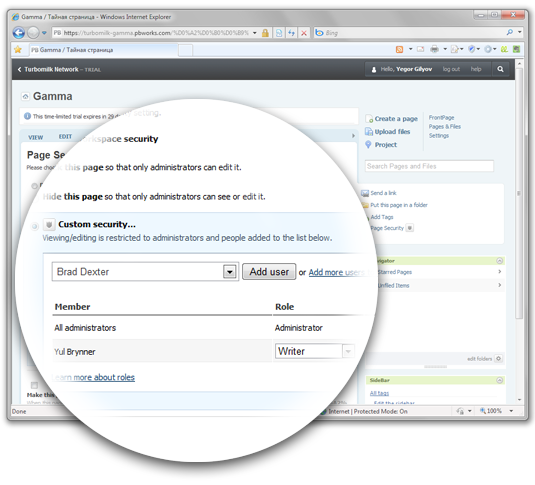 User is enabled to review older versions, compare versions and undo them if necessary. And all these features are available for every page. You can, for instance, create a page with a complete description of task and introduce changes to the task as you go along. Unlike Basecamp where we introduce extra changes and sentences to the original text as comments, in PBworks you can simply edit the text without worrying about saving the original – it is handled automatically. All of the above are the features of a contemporary, useful and rather nice wiki engine. But what really stands behind the “Project Edition” tag in the name? First of all, as I understand, it refers to the ability of introducing “free of charge” guest users into a workspace. Otherwise we could hardly talk about using this project for communicating with clients in a small service company, since the customers would easily outnumber the employees, and it would be rather hard to pay for each user for being too costly. It is obvious that this section is a side add-on to the system, and, as such, it is not it’s strongest side. But even in Basecamp milestones and tasks are far from being the most important things. The main thing is communication! So what is the bottom line? We need to say that the developers of PBworks have paid a titanic effort making their product more fit to the general people out there. However, wiki is always wiki and to be able to work with it one should be a little bit a wiki-psycho. Just a little bit. PBworks gives a much larger degree of freedom in organizing information than Basecamp, and you should be able to handle this freedom to avoid turning it into a chaos. If you are ready for it, the software is worth it. For the most patient readers who read it up to here we have a special offer: tell us in two words why you are interested in this product and you will get PBworks Project Edition for 30 days absolutely free. In addition to that specially trained staff will help you set up the system. Clearly, the last part of the offer is the most essential part. A standard trial without any help from trainers) can be easily accessed at PBworks official site without any extra help from our side. Nice post, especially your part about how to look for these tools. I spent some time playing around and settled on ProjectSpaces — http://www.projectspaces.com, because although it did not have every feature in the book, I was able to easily setup projects and not have to take too much time training clients on how to use it. Might want to give it a shot too. This is information is very useful, thank you. But I am concerned with having to use multiple software to accomplish online CRM tasks while fulfilling management needs for my freelance projects. It’s good that I found one that came in handy for collaborative CRM and project management – http://www.worketc.com/CRM_Project_Management — with the integration of business tools that meets multiple needs such as time-tracking, resource leads, and billing. It is easy to use and fast. It includes many tools like time tracking, Collaboration, Milestones, Online File Proofing, Real Time Chat and many more. Hyper Office is another alternative for you to consider. Theyre one of the oldest collaboration companies since 1998. Check out the review of HyperOffice at PC mag. When you wrote your review, we hadn’t released Apollo yet. 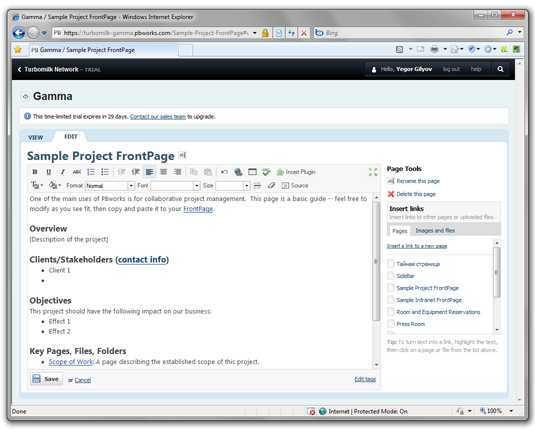 Apollo includes both project management and CRM with cases&deals, calendar, and timers. And it’s a very fast AJAX-based application (which means that it will feel like a native one). DIsclaimer: I work for Applicom, which makes Apollo! Timedoctor, Talygen is compatible with android and therefore helps me track my time spent to be accessed remotely from my smartphone as well.